The Symbiant Quiet Door Drive. 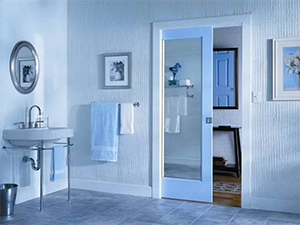 The Quiet Door Drive quickly detects if anything enters the path of the closing door and will auto-reverse direction. Not a single gear or motor is used in the Quiet Door Drive. Driven by magnets, the door barely makes a sound. The Quiet Door Drive can be operated by motion, switching, or through integration with Symbiant Home Automation. No gears, motors, or linkages. Functions like a standard door during power outage. Openings up to 44 inches. Automatic reversal if obstacle is detected. Decelerates when closing to avoid noise and for added safety. Symbiant Core and wiring to track.